The 2012 European Soccer Championship will be held in five Poland and five Ukrainian cities, Polish newspaper Gazeta Wyborcza reported on Thursday. Claiming that such a decision will be made public by UEFA next Wednesday, the daily said that among Poland’s lucky cities will be Warsaw, Gdansk, Wroclaw, Poznan and Cracow. In Ukraine chosen will be Kiev, Doneck, Lvov, Odessa and Dnepropetrovsk. According to Polish Sport and Tourism Minister Miroslaw Drzewiecki, the UEFA’s Wednesday decision will not be final. In his opinion matches will be played on no more than eight stadiums. 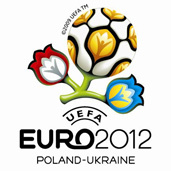 Poland will co-host the European soccer championship with Ukraine.